Requirements: Windows XP/2003/Vista/2008/7/2008 R2/8/2012 (32-bit or 64-bit versions). NetGong is an intuitive network monitoring tool that allows network administrators, webmasters, and Internet service providers to monitor any networked device on the Internet, corporate intranet, or TCP/IP LAN and receive alerts immediately via audible alarm, message, e-mail, or third-party software when a connection fails. It is a powerful personal monitoring product delivering low cost, simplicity of operation, and round-the-clock coverage. Main features: runs as a system service automatically on startup, allows you to monitor network devices or services without installing an agent on each machine, allows all parameters to be set independently for each network resource, permits you to temporarily disable monitoring of certain resources, alerts you to failures using a variety of techniques ranging from audible alarms to third-party software, allows you "fine tune" the alerting functions to avoid unnecessary alerting during an extended failure, alerts can be enabled for any combination of failure and recovery notices, allows custom alerts to be created for each monitored resource, each alert type can be tested in order to verify that the alert is configured correctly prior to going live, allows e-mail notification via SMTP with the server of your choice, provides significant security benefits during authentication with mail server and data communication, supports keyword values and customized message information, offers real-time and historical reporting capabilities to assist you in tracking network resources availability, provides reports in HTML format to help keep track of network resources availability in an easy to view list, provides remote access to the monitoring results using a Web browser. This release includes improved Event logging that allows you to view the description of each event, improved Remote access that allows you an easy access to the monitoring results, and improved monitoring engine that allows you to configure the status of monitored devices. 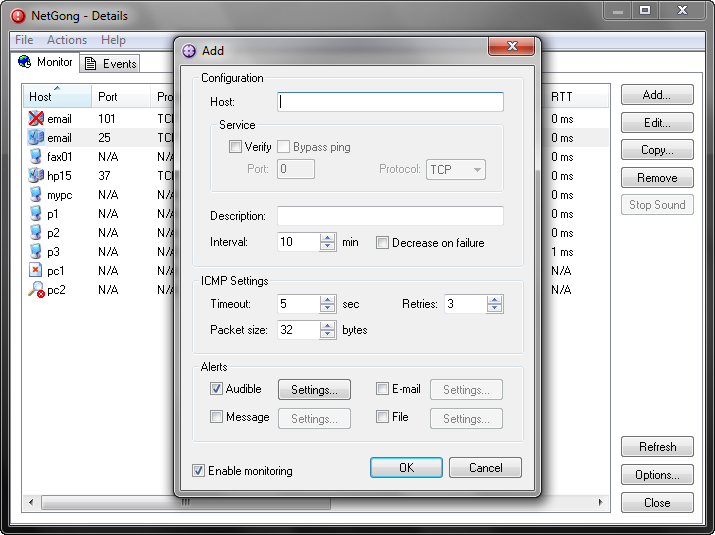 internet tools,internet utilities,network tools,network utilities,network monitoring,network monitors,ping monitors,port monitors NetGong is an intuitive network monitoring tool that allows you to monitor connectivity and device availability of your network.